Fritsch starred at soccer in his native Austria, playing for the Rapid Vienna club plus the Austrian national team. Discovered by Cowboys scouts who were touring Europe in search of soccer-style kickers, Fritsch signed a free agent contract and moved to the US. He started the 1971 season on the taxi squad but was activated at midseason, and while he kicked a game-winning field goal in his NFL debut, a subsequent pulled hamstring had him sharing the kicking duties with Mike Clark. 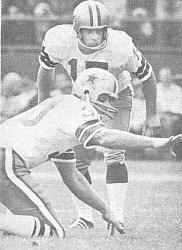 The gregarious Fritsch followed up in ’72 by connecting on 21 of 36 field goal attempts and all 36 of his tries for extra points and in 1973 he led the league as he made good on all 43 PAT attempts and was successful on 18 of 28 field goals. Fritsch missed the entire 1974 season due to a knee injury but returned in ’75 and reclaimed his job. Cowboys went 10-4 to finish second in the NFC East and qualified as a Wild Card for the postseason while leading the conference in rushing yards (2432) and total yards (5025). Won NFC Divisional playoff over Minnesota Vikings (17-14) & NFC Championship over Los Angeles Rams (37-7). Lost Super Bowl to Pittsburgh Steelers (21-17). Following an inconsistent preseason in 1976, Fritsch was traded to San Diego and lasted for five games before being released. He joined the Houston Oilers just prior to the ’77 season and bounced back with 12 field goals in 16 tries, good for a NFL-leading 75.0 %. Fritsch spent five seasons with the Oilers and twice more led the league in field goal percentage while also garnering consensus first-team All-NFL and Pro Bowl honors in 1979. Beaten out by Florian Kempf in the 1982 preseason, he joined the New Orleans Saints, where he was reunited with ex-Houston coach Bum Phillips, and retired following the season. However, he returned to pro football with the Houston Gamblers of the USFL in 1984 and topped the circuit in field goal percentage in both ’84 (80.8) and ’85 (87.5), his last two pro seasons. In the NFL, Fritsch was good on 157 of 231 field goal attempts (68.0%) and, adding 287 PATs, scored 758 points. Of those totals, 66 field goals out of 107 tries and 119 PATs, for a total of 317 points, came with the Cowboys. In the postseason, he booted 20 field goals in 25 tries, setting a NFL record by kicking at least one in 13 straight playoff games, and made good on all 26 of his PATs. In the USFL, he was successful on 42 of 50 field goals and added 126 extra points for 252 total points. Fritsch was a first-team All-NFL choice once, received second-team honors after one other season, and was selected to one Pro Bowl. He also received first-team All-USFL recognition in 1984.